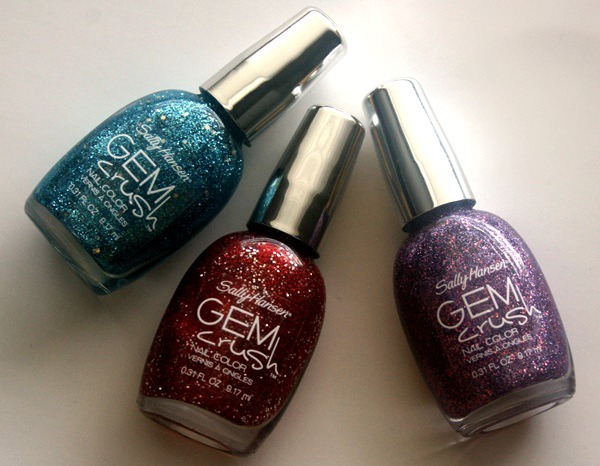 Sally Hansen Gem Crush Nail Colors($6.95) are full on glitter polishes packed in an opaque color base. The polishes are loaded with multicolored glitter, small, big and hexagonal. They look amazing worn alone or over another nail color. Be-Jeweled is a medium purple with green, red, gold and silver glitter. The color looks stunning on fingers and toes. Bling-tastic is a blue with tiny silver and blue glitter. The color comes off a little teal-y in pictures but, it is a little more vivid and blue than it looks in this picture. Cha-Ching is a bright and beautiful red with silver and red chunky glitter. The color looks fantastic worn by itself or over a dark base. All colors feel very gritty since the glitter is quite chunky and start chipping after 3 days with a good top coat on. The polishes applied very well and took longer than usual to dry. I love Be-Jeweled in particular since the color has a lot of multi-colored glitter and the purple will look good on most skin tones. All polishes were very opaque in two coats. Cha-Ching seemed a little more opaque than the other two polishes. These are some great glitter polishes with a nice price tag and wear really well by themselves or when layered over other polishes. If you love sparkly polishes loaded with a super dose of glitter, the Gem Crush range offers a nice shade selection that is worth trying. Have you tried the Sally Hansen Gem Crush Nail Colors ? I love glitter/ jewel nail polishes and all these shades are awesome !! Aren't they? They also have a good opaque base! Ohh, I am loving Be-Jeweled! Oooo the red one is so pretty! I love these! I have Be-Jeweled and Glitz Gal, the dark grey one. Glitz Gal is amazing! My drugstore is always out of it. Such a pretty color!